A deadly and violent storm rocks the sleepy town of Elway, Maine. The freak, late-fall lightning celebrates a terrible anniversary, known only to a few. 52 years ago a gateway to another world was foolishly opened, unleashing an army of murderous demons. They spread like a disease, killing the townsfolk and using their bodies as decaying hosts while they…grew. But they would be stopped. Five teenage strangers, with awesome supernatural abilities, found the courage to stand and face the grotesque horde. Though they did not survive, it was enough to end the horror and close the gate, burying it forever…or so it seemed. Sheriff Percy Massey hates “special circumstances”. If it weren’t for special circumstances, it would have been one of his deputies at the muddy construction site that late October day. He could have been at home in front of a roaring fire, with his loyal basset hound and a glass of Kentucky bourbon. Not getting drenched in a terrible thunder storm staring at a grotesquely deformed skeleton, unearthed with the buried shingles of a buried house. As a curious construction crew gathers around, the rotted ground gives way! The Sheriff and several workers crash through the rotted floors of a buried house, one by one, all the way to the dark basement. There they find an ancient stone gate, fed by tubes, pipes and wires. Frantic to escape, power to the dusty machinery is “accidentally” triggered. In a desperate attempt to turn it off, Sheriff Massey falls through the glowing gateway – only to immediately appear on the other side. But he’s not the same. In fact he’s not even human and he’ll be only the first in an army bent on destroying all life…starting with the construction workers trapped in the basement with him. Five outcast teenagers from different walks of life, all drawn to Elway for different reasons, will stand to face the hell that spews from the gate. Complete strangers in a strange new town, they will find that they are humanity’s only hope at survival this Halloween as they learn to control horrible supernatural gifts. Alex, a buxom Bettie with a real bad attitude, has bounced through foster homes and juvie halls her whole life. If you let her get close, you won’t see the knife coming. Aside from being a borderline sociopath, she has no supernatural abilities. Yet. Jimmy is a blond greaser who just wants to live fast, live to be real old, and be good-lookin’ the whole gee-dee time. He’s terrible at school, but great at getting under his father’s skin. He can also build and power any machine he can dream up. William is small for his age, but what he lacks in size, he more than makes up for in creepiness. But you’d be creepy too if all of your closest friends were ghosts. Since his folks died, it’s natural that he’s felt right at home with his Grandmother – in her house next to the Elway cemetery. Sandy, the blond bombshell, is as sweet as the southern breeze that used to pass over her family plantation – as long as you don’t push her. She really would kill for a spot on the cheerleading team, a dashing new boyfriend, and a pony. But she would settle with not being demonically possessed. Chet is a cocky nerd with a chip on his shoulder the size of his father’s political ambition. He’s a straight-A student, rich as hell, and telepathic to boot. No wonder he’s captain of the debate team and dating half of the Elway High Cheer Squad – after less than a week. As the demon gate opens across town, all five teens fall into a trance-like state. They drop whatever they’re doing and silently leave their homes and schools, drawn to an eerie mansion at the edge of town. And the waiting Mr. E.
A stage-show magician by trade, James Edwards (“Mr. E”) welcomes the bewildered teens to his dilapidated estate. After some hasty introductions, he wastes no time in telling them of the terrible hand fate has dealt them. At the turn of the century, a madman built the gate in a vain attempt to bring his lost love back from the dead. It worked, but she was not the same, and in doing so, he hastened the end for all the citizens of Elway. Creatures from beyond, using human bodies as dead hosts, wiped out the town before a teenaged Mr. E and a group of 4 other adolescent strangers could stop them. Those five supernatural men and women, like these five, were the balance to counteract the opening of the gate – the supernatural world’s way to even the odds. They fought the creatures with new-found abilities, and managed to banish the demon army back to the nether-realm. But only Mr. E “survived”, and now the gate is open again. Unwilling and unable to believe the old man’s spooky story, the teens leave the crumbling estate - with the exception of William. He knows full what’s happening, as confirmed by the spirit of his newly departed grandmother. The truth waits back in Elway for Alex, Sandy, Chet and Jimmy. They and their families are attacked by undead townsfolk, who spread disease and darkness to everything they touch. Unable to save either their families or friends and neighbors, the teens race back to the mansion…but it’s too late. The mansion is under attack, and Mr. E and William are both killed while trying to defend the town! In shock, and in danger of being overwhelmed, the four remaining teens run again – to Chet’s family cabin in the imposing woods outside of town. They mourn their losses and fight over whether they should go back…but William is not yet gone and he lets them know there is nowhere left to hide. They face an impossible task: stop from trying to kill each other long enough to learn how to control their strange new abilities, all while keeping raging teen hormones in check. And save the world. Powered by infernal energies,The Buried House rises again and the town is destroyed. A giant and terrible evil waits just beyond the gate…to walk the earth again. Tomorrow is Halloween and even if these five young greasers, rockers and geeks can stop fighting long enough to save the world and close the gate – how long will it stay closed for this time? 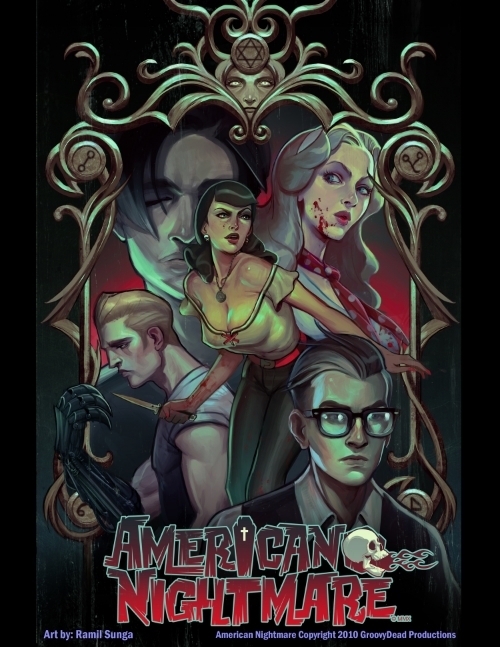 This is small-town death, destruction, and a supernatural battle royale in the 1950s.